Would you like to become a Friend of Chelm-on-the-Med? JOIN THE 'LAUGHTER BRIGADE' - NOW! Give people- Jews and Gentiles - reasons to LAUGH about Israel, instead of feeling SAD, ANGUISHED, DISHEARTENED, WORRIED, DISENCHANTED, UNCOMFORTABLE, ASHAMED OR ANGRY! 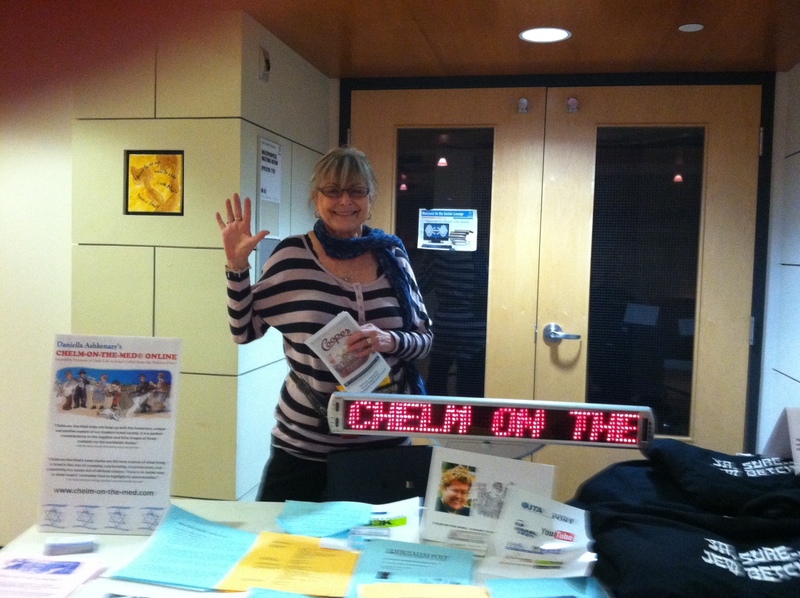 The Chelm Project is a private pro bono endeavor. It needs 'campaigners' and 'cheerleaders'. IF YOU LIKE CHELM-ON-THE-MED© - SPREAD THE WORD. ● E-mail friends and relatives. Make it a short personal e-mail in your own words and ask them to share this with others. In fact, invite the worst Israel basher you know to subscribe; humor is disarming. Chelm already has readers in 66 countries - including China, South America and Muslim countries. NOTE: If you send the same message to a group of friends at the same time - respect their privacy by using 'bcc', not 'to' or 'cc' for message recipients. ● Talk it up on Twitter, Facebook and other social media, and in chat rooms and list serves you belong to. ● Write or call your local Jewish paper and tell the managing editor about Chelm-on-the-Med©. Recommend they run stories, and be sure to let them know that newspapers - commercial and non-commercial - have permission to publish stories for free. Send the editor your favorite story as a sample. 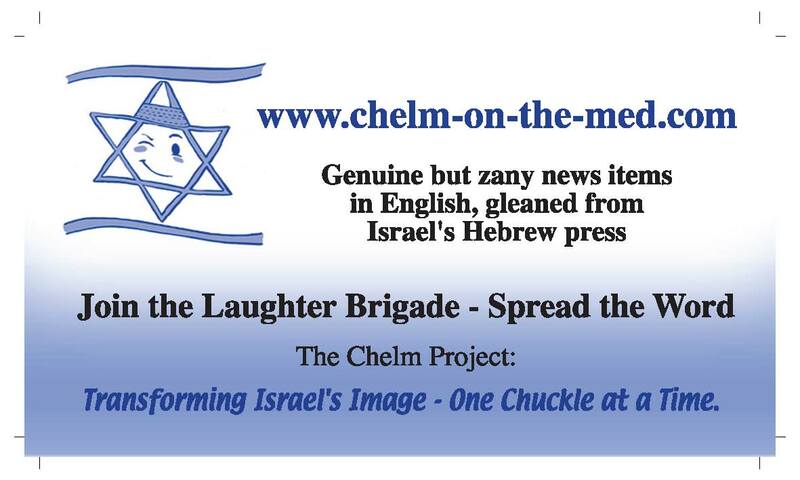 Tell authors of odd news columns in the general press about Chelm-on-the-Med© Online as an odd news source, noting that Israel is rarely mentioned in their columns (if this is so). ● Recommend that your local Jewish radio station or radio program read or paraphrase these stories on the air - ad hoc or as a regular zany news from Israel 'corner'. ● Tell your synagogue or church newsletter that they can reprint these stories for free. ● Tell your synagogue or church educational director that these stories can be used to change kids' perceptions of Israel. ● Tell your rabbi or minister. Vignettes are great enhancers for sermons. ● Tell the local shaliach (Israel emissary) about Chelm. ● Get local Jewish schools and youth organizations involved in spreading the word as a pro-Israel 'project'. (Feel free to print up T-shirts with the winking flag on the front, and the URL and your favorite vignette on the back...) Suggest schools and youth organizations use Chelm stories in their programming (ad hoc or as a regular 'corner') - in weekly activities, at summer camp and so forth - even stage them as a camp play. ● Post a postcard or half-page notice at the local JCC, the local Jewish or kosher deli, Israeli or Jewish gifts store with the title and URL. ● Post a notice on free online bulletin boards in your Jewish community...or the free classified of your local Jewish paper. ● If you have a laser printer, print up two-sided fliers (it doesn't have to be color) and distribute them at Jewish and pro-Israel events. NOTE: You may have to copy-paste the text into a different template designed for the stationary stock you purchase. Spread the word. Help re-brand Israel! ● Are you a journalists or blogger? Spread the word on your website whether with a short blurb (OK - it's a plug), full-blown feature or profile (Right on! 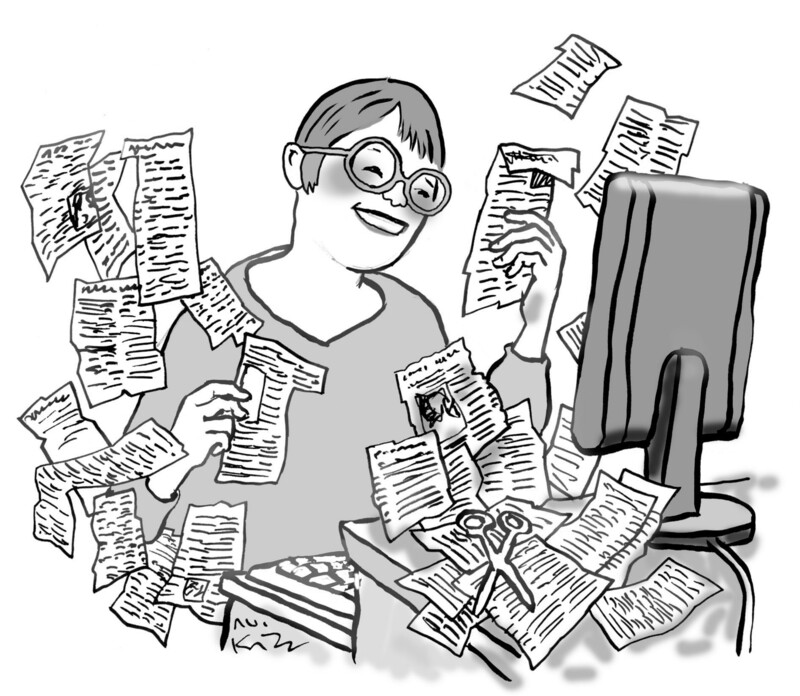 ), interview (I'll provide the teasers) or tip to a well-placed colleague or endorsements and exposure of other kinds. Write your own, or use this ready-to-run feature, and enhance it with the winking flag logo, a link to the television demo or other visuals in this tool box. ● If you have a website/blog, add Chelm to your favorites / links. Even better, post a link on your homepage with the signature 'winking Israeli flag' logo. ● If you see articles in online newspapers and magazines about Israel's image or Israeli advocacy, animated news and other relevant topics - write a talkback that tells readers about this unique endeavor - citing the URL, if allowed. The same applies to slanted articles / discussion that present a warped picture of Israel: suggest that readers / other talkbackers can get a fresh perspective that goes beyond conflict-driven news by reading Chelm-on-the-Med© Online. Please - keep the tone civil. ● Send a link (http://www.youtube.com/watch?v=MoUmGgbD6uk ) to the animated news demo on youtube.com to Jewish and pro-Israel Christian television stations and suggest they become affiliate stations for these weekly snippets designed to balance 'hard' news from and about Israel with one upbeat and offbeat item. ● Engage others as volunteers. Share this 'call for a Laughter Brigade' with others. Send them a link. Or copy-paste this page into an e-mail. Feel free to contact me directly via the website (faster) or via chelmonthemed AT gmail DOT com. If you have other ideas how Friends of Chelm-on-the-Med© can spread the word or use Chelm content to change Israel's image, suggest them. I'd love to hear what you are up to and what kind of response you are getting.